Sen. Sherrod Brown, D-Ohio, questions Treasury Secretary-designate Steven Mnuchin at his confirmation hearing in January. On Thursday, Brown asked Mnuchin for a list of Trump business associates. 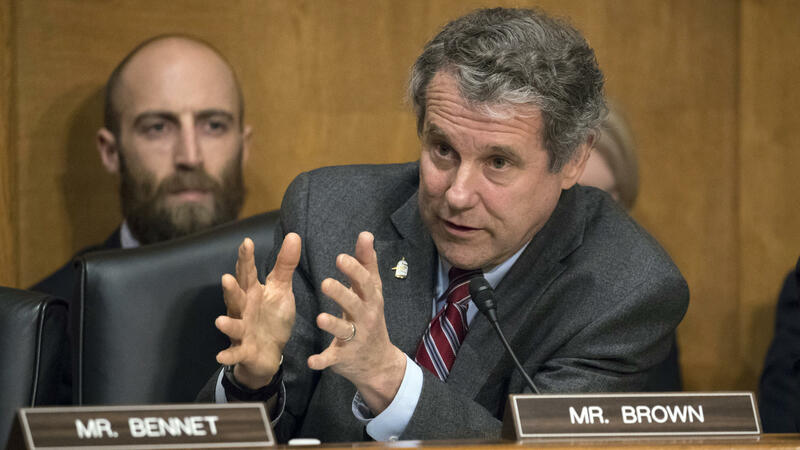 At a Senate hearing Thursday, Sen. Sherrod Brown, D-Ohio, accused Treasury Secretary Steven Mnuchin of failing to answer his questions about President Trump's business ties to people who might be violating money laundering and other U.S. laws. Mnuchin responded by suggesting Brown "just send me a note on what you are looking for." Brown pointed out that he had already sent a two-page letter. The Senate Banking Committee hearing provided the kind of sharp exchange that underscores the gap between what Democrats in Congress want to know about Trump's business dealings, and what Trump administration officials appear ready to provide. "I haven't received an answer that I asked for — about potential conflicts of interest and ownership in the [Trump] administration," Brown said, referring to a March 2 letter he wrote to Treasury. The letter requested a "comprehensive list" of the Trump family's "investors, business partners, politically exposed persons and related actors." Such a list is needed to reveal whether Trump's associates and investors have been in compliance with laws related to bank secrecy, sanctions, money laundering and other regulations, Brown said. "Would you commit to us to get a complete list of Trump business associates and financial ties?" Brown demanded. "People want to know about those entanglements." Mnuchin replied by saying he had checked to make sure "my staff had fully responded to all the inquiries from you and the committee, and I believe we have." He pointed to a March 31 letter that Treasury had sent to Brown. That brief letter contained no list of Trump associates. Instead, the two-paragraph response said only that Treasury officials would "work with agency personnel to address and mitigate potential conflicts if and when they arise." Mnuchin then suggested Brown send a note about what he wants, and "we will review internally whether it's appropriate to come from us or somewhere else." Brown again said that he already had asked his question and, "it was not answered." He added that he would write to Treasury again requesting a "complete list" of Trump associates because "people in this country are troubled by the president's business connections" who might be involved in crimes. Mnuchin replied by saying, "I can assure you that if there were any cases that involved the president or any members of his family, that they would be treated very seriously."